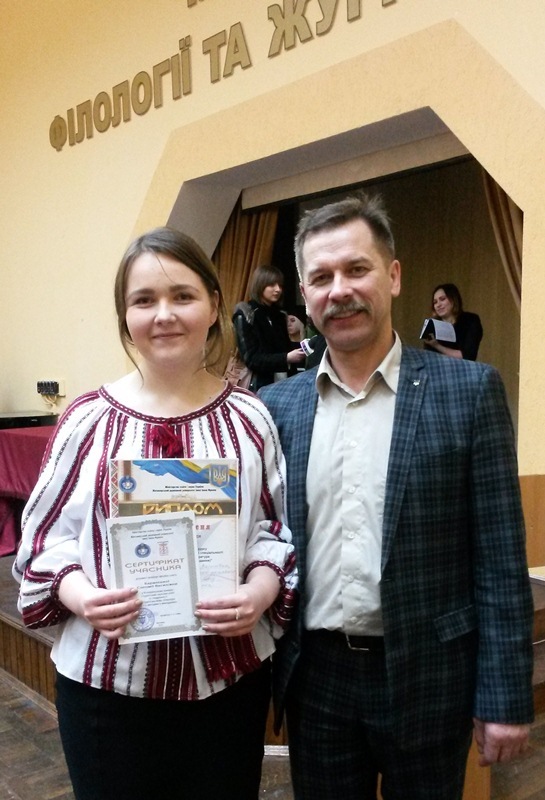 17 March 2016 a student of the Faculty of Philology Solomiya Baranska (Ua-23B) was awarded the third degree diploma in the finals of the second round of the National contest of student research papers in the specialty “Ukrainian language” held at Ivan Franko State University, Zhytomyr. We congratulate Solomiya Baranska and her supervisor, assistant professor of the Ukrainian language Maria Stetsyk. Solomiya Baranska with the head of the jury Victor Moysiyenko (Doctor of Philology, Professor, Head of the Ukrainian language Department, Ivan Franko State University, Zhytomyr).